We all know Bill Gates. Business mogul, ruler of the Microsoft universe, owner of.... well, virtually everything. Now good ol' Bill has begun to apply his genius (and his money) towards solving the country's energy crisis. His solution: Nuclear Power. Nuclear Power? Really Bill? Now, like any good Environmental Engineer worth her salt, I'm familiar with the many merits of nuclear power, but as with anything, nuclear power has its fair share of downsides. First lets discuss the good stuff! 1. Emissions: Nuclear reactors produce power with significantly less CO2 emissions than coal. However, its emissions aren't zero. Transportation of fuel and waste produces CO2. 2. Fuel: There is no shortage of nuclear fuel. Nuclear power most commonly uses uranium to power the reactor, however scientists have begun to develop nuclear power using other elemental fuel sources such as Deuterium (yes chemistry buffs, I'm aware this is not an element, but it's basically hydrogen, so it counts). 3. 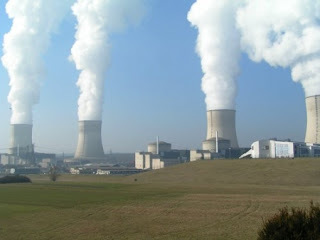 Cost: Nuclear power is relatively cheap to produce. It costs about 1.7 cents/ kWh to produce nuclear power, while coal produced power costs about 2.2 cents/kWh. Now for the not so good stuff. 1. Nuclear Waste: The production of nuclear power uses radioactive substances for the fission process. After this fuel has been used, it continues to be radioactive. This presents a rather challenging problem. What do we do with the waste? Several options have been presented over the years, the most high profile being that of Yucca Mountain. A proposed underground storage site in the Nevada desert. However current storage options are minimal. Basically, there are none. Nuclear waste is commonly stored on the site of the nuclear plant in steel containers to prevent leakage. 2. Safety: The safety of nuclear power generation has been a hot topic of late, due to the Fukushima nuclear plant failures in Japan after the recent natural disasters. Safety has and will always be the number one reason why people are opposed to the increase in nuclear power generation. The name nuclear power alone conjures images of mushroom clouds created by nuclear weapons. There is always a risk that nuclear power plants will have a "melt-down". When a nuclear plant "melt-down" occurs, it means that the nuclear cores have been damaged due to overheating. Overheating can occur in many ways, both from human and mechanical error. 3. Water Waste: In order to prevent "melt-downs" from occuring, nuclear plants use large amounts of water to cool the reactors. Typically this water is drawn from a fresh water source such as a river or a lake, used once throughout the cooling process and then discharged into either the same or different water body in which it came from. The water discharged is often a much hotter temperature than the receiving water body. This temperature difference can effect the wildlife within the water body. Heavy metals and salts can also build up in the water throughout the cooling process, causing them to be discharged into a receiving water body as well. Though there are some great advantages to the production of power through nuclear reactors there are some major problems that need to be fixed before large scale applications can be implimented. Though cleaner than coal, oil, and natural gas, it is important to remember that nuclear power is not a renewable energy source. Though there are no shortages of uranium stores, supplies are not unlimited, nor is nuclear fuel a free resource. However, there are unlimited supplies of wind and sun, which both happen to be free. It seems to me that Bill Gates' money would be better spent helping these renewable energy sources advance as opposed to nuclear power. But who knows? Perhaps Bill Gates' money and his genius sized brain will solve the country's energy crisis, one nuclear power plant at a time. Though I am a senior in college, one of my guilty pleasures that has remained since youth is the Disney Channel. I just can't help being attracted to the cheesy sit-coms and over zealous acting. On one of my recent visits to childhood nostalgia, I was intrigued by one of their "campaign" commercials. The commercial was advocating doing ones laundry in a "green" way. Now, I have always been proud of the Disney Channel for championing the environmental cause. Their "Friends for Change" campaign advocating recycling and sustainable practices for children was a great way to make America's youth aware of growing environmental problems. However, this new "green" laundry commercial seems a bit far reaching. Though the tips they present are great (using cold water to wash your clothes, cleaning the lint filter after each drier run to increase efficiency, hanging clothes outside to dry) I feel this new commercial is a bit forced. It seems that Disney has run out of tips. Never fear though, a company as large and far reaching as Disney couldn't possibly run out of new ideas to save the planet. As a recent graduate from Purdue University with a B.S. in Environmental Engineering, I feel reasonably qualified to bring to you new and innovative ideas about the green movement. Please feel free to question my opinions. I can't resist a good debate.